but surely it could have been worse. I'll preface by saying Rob is out of town. He's actually out of state, in a desert somewhere in Texas doing combat casualty training. He just left Thursday and we already miss him so much. Ok, on the with story. I was on call Friday (aka I spent 24 hrs at the hospital) and when I went out to leave Saturday morning, my car wouldn't start. If you know me, you know I LOVE MY JEEP. This jeep has been by my side through some trying times. I marched up to a dealership and bought the jeep all by myself fresh out of college. 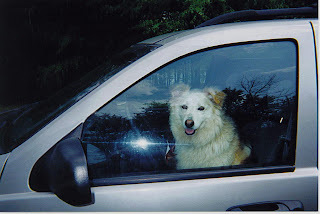 The jeep accompanied me to Virginia, where my only other living companion was Lady, until I met fabulous friends and my soul mate, of course. The jeep got me through 2 years of driving in snow in southwest Virginia. We've just been through a lot together, okay? I think its a girl thing to get really attached to your car, at least Rob thinks so. He objectively points out that the jeep has also left me stranded on I-64 (where I caught a ride with a roofing crew--thanks Shaddeau Roofing!) and cost us a new transmission a few years back. Anyway, I look past these faults and accept them as "endearing" character traits/flaws just the same as you would for a lifelong friend. Back to this morning, security came and jumped started me and all was fine except I had a sneaking suspicion that there's a short in the electrical outlet causing my tail lights to stay on and drain the battery. After a day's worth of electrical diagnostics and battery testing, turns out they can't find anything! It was a really long day and I was exhausted (having not slept on call) and the worst part was, I couldn't even go pick Rowen up! Oh, how I depend on that dear husband of mine! By the way, in case you're wondering, I still find redemption in the jeep despite its shenanigans today. At least it started with jumper cables, right? I am ashamed to admit I felt something close to despair today. I want to be able to handle these stressful situations gracefully and without anxiety and, at the end of the day, I can say I did handle it, but there was a fair amount of anxiety involved. Just worrying about how I would get Rowen, how I would get to work, how much the repair may be, etc. I take for granted that Rob usually handles all such unpleasantries. This brief separation will be tough as I get used to fending for Rowen, myself and Lady, but I know God will grow us through this experience. For those readers of Purpose Driven Life, you'll recall Life is a Test. Today God gave me grace by having me call 2 friends and neighbors; one to take me to the auto repair place and one to take me back. I was actually considering taking a cab to and from just because I hated to bother anyone! Then I thought about how upset I would be if I knew a friend or neighbor took a cab instead of calling me to lend a hand. It really turned out to be a blessing that I was able to lean on friends that way. Thanks, Mollie and Chris and Luke and Aimee! This experience reminds me of my favorite devotional by Oswald Chambers. It's called Gracious Uncertainty and it is from My Utmost For His Highest.
" Certainty is the mark of the commonsense life--gracious uncertainty is the mark of the spiritual life. To be certain of God means that we are uncertain in all our ways, not knowing what tomorrow may bring. ...As soon as we abandon ourselves to God and do the task He has placed closest to us, He begins to fill our lives with surprises. ...We are not uncertain of God, just uncertain of what he is going to do next. ...Leave everything to him and it will be gloriously and graciously uncertain how He will come in--but you can be certain that He will come." So, maybe if I had been graciously uncertain today, I may not have worried as much, knowing that God would provide. Maybe I've learned something for next time. I have a ton more to write about, but I need some sleep. Before I close, I did want to mention our friends, Mollie and Chris (see above) who will be leaving Norfolk for California on Monday. Rob and I have been abundantly blessed by these two amazing Christians and are sad to see them go. Mollie and Chris have a true Christ-centered marriage and I don't think the 4 of us could ever run out of things to talk about. I'm sad that we didn't get to spend even more time with them, but I've never been to California, so we'll just have to make the trip! I'll close with a few words from a beautiful song written by Laura Story. I'm sure you've heard it. It always inspires me. You are as insightful here as you are on the floors of the hospital, Meryl. Incredibly impressive and I'm sad to be leaving before I've gotten to know you and Rob well - my sister gave me this book recently and I haven't gotten to it yet...Oswald, you're up next, buddy. Thanks again for your excellent posts.